Have you heard of LuveBug Probiotics? They are a great way to get a good balance of bacteria in your gut. LoveBug Probiotics have been created by a Mom and Dad, Ashley and Ben Harris. After being diagnozed with a dark cloud of diseases, they went onto their own search to find out how they could bring their immune system up to fight with internal pathogens. LoveBug probiotics were born out of necessity. Yet now, this young brand of effective and tightly-targeted probiotic supplements is taking the market by the storm. Ashley and Ben have created a set of the following LoveBug probiotic supplement to balance out bad bugs out of our intestinal flora. 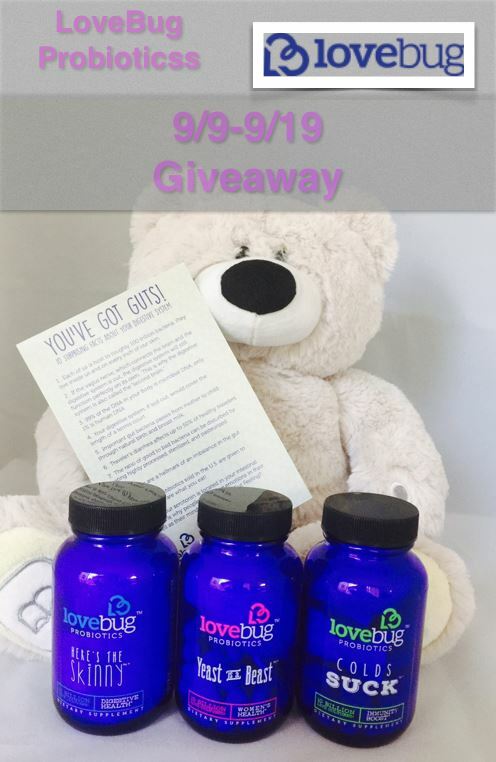 Enter below for your chance to win a great Love Bugs Probiotics Prize Pack – a perfect solution for taking care of your gut! I have to take vitamins and iron because i had wls and my body does not aborb stuff like reg peeps.. never tried an probiotics before. I take probiotics. Both pill form and also kefir and yogurt. I am a big believer in probiotics and love to hear about new brands. I am even more excited that they also have a Yeast is a Beast kind. That would also be super helpful for my family. Yes I take a supplement occasionally. I do take probiotic supplements but not consistently. I also get probiotics is live culture yogurts. I’ve never tried probiotics, but I would like to. I have not currently taken anything, but I would like to take something to help. This would be perfect. I have taken several kinds of probiotics and have never been able to find one that is really good. I have taken probiotics but I’m not as dilligent as I should be about taking them daily. I used to take probiotics, but I don’t currently. I would love to win this & start taking them again! I don’t consistently take probiotic supplements but I know I should. I don’t take any but I’ve read about the benefits and would love to. I also took probiotics but ran out–they’re expensive! Hoping to win some here but I do take vitamins and supplements. Yes, I take a capsule probiotic and eat fermented cabbage and yogurt regularly. I take supplements and use essential oils but I haven’t used probiotics. Yes, I do currently take probiotics. Am looking for one that is a better quality then what I currently take. I used to take probiotics but I don’t right now.